Edward Murrow’s dedication to advocacy journalism can be summed up in his own words “American traditions and the American ethic require us to be truthful, but the most important reason is that truth is the best propaganda and lies are the worst.” Murrow is perhaps best-known for helping to bring down U.S. Senator Joseph McCarthy who falsely accused government officials and other public figures of being Communists. However, Murrow’s fear that McCarthy posed a real threat to civil liberties developed into a determination to use his TV documentary series “See It Now” against the senator.Murrow and his producer, Fred Friendly, prepared a half-hour program focused only on McCarthy and his tactics. They knew that McCarthy would launch a personal attack on Murrow himself. Even so, Murrow understood that on television a skilled journalist and his technology-savvy team of editors, writers, and producers enjoyed real advantages. They could pick the least flattering video clips, flip McCarthy’s many contradictory statements and charges, and employ their skills to portray the senator in an unflattering light. Murrow he believed that McCarthy posed an immediate threat and that the American people, when confronted with the truth, would repudiate McCarthy.Murrow’s own broadcast featured excerpts from the senator’s own speeches which contradicted and turned McCarthy’s words against him.When the broadcast ended, CBS was flooded with telegrams, telephone calls, and letters. They ran 15 to 1 in Murrow’s favor. On December 2, 1954, the U.S. Senate censured McCarthy for conduct unbecoming to a senator. From the 1955 Montgomery bus boycotts to the murder of Dr.Martin Luther King Jr, technological innovations enabled television to bring the non-violent civil disobedience campaign of the Civil Rights Movement and the violent reprisals of Southern law enforcement agents to a new mass audience. The NAACP’s 1954 landmark Supreme Court case, Brotvn v. Board ofeducation, along with the brutal murder of 15-year-old Emmet Till in Mississippi and the subse- quent acquittal of the two white men accused of his murder marked the beginning of America’s modern Civil Rights Movement. The media coverage of the Till case helped to increase the membership of civil rights organizations nationwide. As civil rights workers organized mass boycotts and civil disobedience campaigns to end legal segregation and white supremacist terror in the South, white segregationists retaliated with much violence. As black churches, businesses and residences in support of the movement were bombed in order to stop the Civil Rights Movement, it increased the support for civil rights. These events were unfolding at the same time that the percentage of American homes equipped with television sets jumped from 56 to 92%. This was 1955 and television was securing its place in American society. Network news shows were also beginning to expand from the conventional fifteen to thirty minutes format, splitting the time between local and national issues. From the mid to late 1950s, these social, political, technological and cultural events began to converge. So television’s coverage of the Civil Rights Movement changed considerably, especially as the “anti-establishment politics” of the 1960s erupted. When television covered the consumer boycotts and the school desegregation battles in the early days of the Civil Rights Movement, it was usually focused on the most dramatic and sensational occurrences. As well, the coverage in the late 1950s was usually done with a field reporter conducting a stand-up report from a horrible scene. Usually, an in-studio anchorman would narrate the events recorded on film. Rarely, did blacks speak for themselves or address directly America’s newly constituted mass television audience. 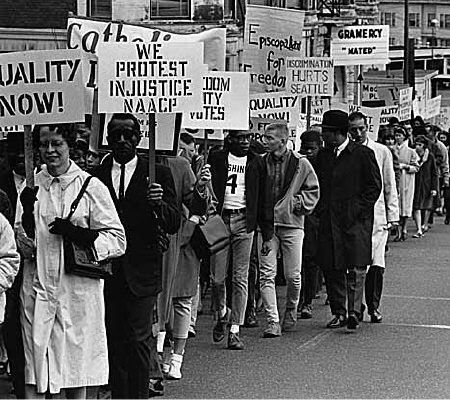 Nevertheless, civil rights leaders understood how central television exposure was helping the success of the movement.